Here is Some Information about Kalika Mata Temple(Shakti Pith) in Pavagadh Gujarat India. The Kalika Mata temple is located on Pavagadh Hill town of Chapaner of 762 m above sea level hight.The temple was built in 10th-11th centuries.The temple is dedicated to Goddesh kali (Durga).he temple is beautifully carved and has an idol of goddess Durga or Maa Kali. The temple has a big and open chowk in the front while the idol of Mata Kali is placed in the inner scantum, which is painted in red. There are many images of Maha Kali together with yantra of Goddess Bahuchara. To reach this temple, one needs to walk 5 kms across the jungle else once can reach through the ropeway that hauls the visitors to Manchi. 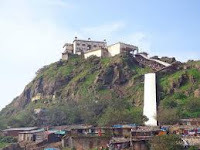 This historical and religious place has Pavagadh Temple, which is a temple of Goddess Kali, an incarnation of Goddess Parvati, Sati, and Durga as power or Shakti. This temple is famous amid the Hindu and Muslim devotee that is visited by thousands of pilgrims every day. They come here to seek the blessings of Goddess Kali. Even though the Goddess has fearful appearance, yet it is believed that she has immense power to grant the wishes of her true devotees. As a regular tourist attraction this temple is also well known for its picturesque view. 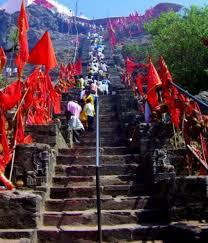 As one of the ancient temples, one needs to climb 250 steps to visit the temple. It is just 50 kms away from Vadodra, Gujarat, India. There is a strong history related with this temple. Maa Kali is considered to be an angry form of our Goddess Durga. Some renowned people like Sri RamKrishna and Swami Vivekananda were believed to be great devotees of Goddess Kali. 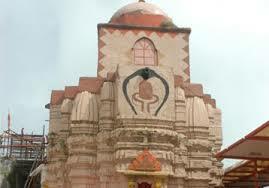 The temple is considered as one of the prominent temples in India as it grants the wishes of the devotees. As per a mythological belief, Pavagadh hill is well known as a symbolic toe of our Goddess Sati, who fell on the earth when the grief stricken Lord Shiva, who was Sati’s husband, carried Sati’s body on his shoulders. The religious fervor and myths attract the tourists to come and visit the Pavagadh Temple every year. By Road : Champaner is 45 km from Vadodara, accessible by bus or private vehicles. Cars can be hired in Vadodara to drive to Champaner-Pavagadh, which is the best option if you want to combine the journey with other sites like Jambughoda. By Train : The Nearest railway station is Halol and Vadodra. By Air : The Nearest Local Airport is Vadodra and Internetional Ahmedabad Airport.